Pre-Requisite: The Level 1 & Level 2 workshops must be completed prior to attending Level 3 workshop. Fine-tune and master your skills using Gottman Method Couples Therapy. Practicum training features video participation and case discussions. 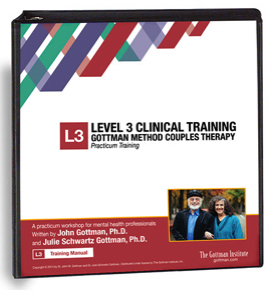 Training for Couples Therapy now offers the Gottman Method professional workshop “Level 3: Practicum Workshop in Gottman Couples Therapy” training created by Drs. John and Julie Gottman. You’ll fine-tune and master your skills using the Gottman Method in your counseling work with couples in your practice. Completion of the Level 1 and 2 workshops are required before attending the Level 2 training. See below for a complete listing of Pre-Requisites before registering. Sign-up for multiple workshops, as a student or intern, or as a group and save up to $250! See registration for details. *** Discounts are available for Combined Registrations to 2 or more trainings, Group Registrations to a single workshop, and Students & Interns. See registration page for more info or call Lisa at (415) 721-4310. During the Practicum workshop, participants will examine videotaped cases of couples brought in by workshop colleagues. These cases are used as learning and teaching tools to deepen your understanding of when and how to use various Gottman Method approaches and interventions, and how to break destructive patterns and replace them with meaningful interactions. We will then demonstrate an assessment or intervention session appropriate for each that couple’s struggle as role-played by audience volunteers. These demonstrations represent the true resistances and co-morbidities we face as therapists and how to we can transform them into effective healing methods for the couple. Following each demonstration, participants have the chance to practice and refine their use of Gottman Method Couples Therapy through participation in role-plays, demonstrations and discussions in a small group setting. We observe each group and offer practical tips and technical refinements for the therapist. No criticism or negative judgement is allowed. Rather, efforts are made to create safety and security for all therapists present in an environment free of criticism and negative judgment. After each role-play session, we’ll lead discussions that include case consultations and nuanced details of the techniques previously demonstrated and provides guidance in developing a roadmap for clinical decisions. Road Map to Gottman Therapist Certification! Participants are asked to bring a short (approx. ten minutes) video segment (on DVD or USB thumb drive) of difficult and challenging couples to the Level 3 workshop. The therapist’s work with the couple will not be critiqued; in fact the video does not even need to show the therapist; just seeing the couple is all that is needed. The purpose will be to use these couples to illustrate how the Gottman Method can be applied to these tough cases. We’ll describe how they would treat these couples and then participants from the audience will volunteer to role play these couples with us demonstrating using a variety of interventions with these couples. Participants break into small groups and take turns, having the opportunity to practice using these interventions in a supportive setting, while the other participants’ in the group role play the couples from the videos. Bringing a video isn’t required, but it will help make the training more meaningful for everyone. If you cannot bring a clip, it would help to bring a brief written description of a challenging couple for the same purpose. This is for Case Discussion within the context of Certification Practicum ONLY and is not related to the videotaped interventions submitted for final Certification Review. Note: We only support digital media on the DVD-format or on an USB external device (USB thumb-drive or external). couple’s assessment and understand its implications. challenges in terms of the “Sound Relationship House”. Payment plans available thru PayPal! These Level 3 workshops are presented in a “Professional Retreat” setting just minutes north of San Francisco and the Golden Gate Bridge at the SF Theological in San Anselmo. Please see registration for venue photo’s and more information. 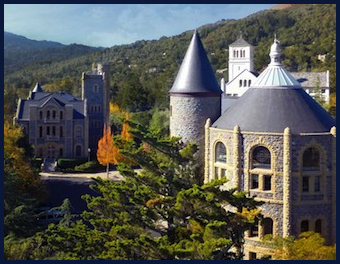 Voted one of the 10 most unique event venues in Marin County, our Gottman Professional Trainings are held at the San Francisco Theological Seminary. Located just 15 minutes north of the Golden Gate Bridge in San Anselmo, CA, the workshops are presented in a professional retreat setting. © 2013-2018 Lisa Lund - All Rights Reserved. Information © 2013-2018 The Gottman Institute - Used by Permission.